I went to a huge book store at Coex mall, Samsung and found this book below. The title says “The greatest rich who knew the secret of tithe.” As you know, tithe is giving and donating one tenth of your whole income to God. Wow, the title is really bold. I believe that this book is saying only one word of Malachi 3:10, “Bring ye all the tithes into the storehouse, that there may be meat in mine house, and prove me now herewith, saith the LORD of hosts, if I will not open you the windows of heaven, and pour you out a blessing, that there shall not be room enough to receive it.” I would know even though I did not read it. The writer knows nothing about the Bible and the word of God. Jesus did not shed His blood to make us rich. 어제 삼성 코엑스몰의 큰 서점에 갔다가 발견한 책이다. 대단한 제목이 아닐 수 없다. 이 책 전체는 말라기 3:10절 “만군의 여호와가 이르노라 너희의 온전한 십일조를 창고에 들여 나의 집에 양식이 있게 하고 그것으로 나를 시험하여 내가 하늘 문을 열고 너희에게 복을 쌓을 곳이 없도록 붓지 아니하나 보라” 단 하나로 압축이 될 것이라고 생각된다. 제목을 보니 안 읽어도 알겠다. 참, 너무나 성경을 모르는 책이다. 예수님은 우리를 부자로 만들기 위해서 십자가에서 피를 흘려 돌아가신 것이 아니다. 십일조의 정의는 창세기 28장 20-22절에 잘 나와있다: “야곱이 서원하여 가로되 하나님이 나와 함께 계시사 내가 가는 이 길에서 나를 지키시고 먹을 양식과 입을 옷을 주사 나로 평안히 아비 집으로 돌아가게 하시오면 여호와께서 나의 하나님이 되실 것이요 내가 기둥으로 세운 이 돌이 하나님의 전이 될 것이요 하나님께서 내게 주신 모든 것에서 십분 일을 내가 반드시 하나님께 드리겠나이다 하였더라” 아비 집으로 돌아간다는 것은 천국에 간다는 것을 의미한다. 즉, 나를 천국에 보내주시면 십일조를 드리겠다는 의미다. 결국, 말라기에서 말하는 것은 온전한 십일조를 하면 영생을 얻어 천국에 간다는 것이다. 십일조 드리면 돈 많이 벌어 부자된다는 헛소리는 좀 안들렸으면 좋겠다. I bought my flight ticket in the long run. Northwest Airlines is much cheaper than Air Canada. I am going to Toronto Canada at last wednesday (28th), March. Good bye Seoul. 🙂 Total flight takes 15:24 hours. 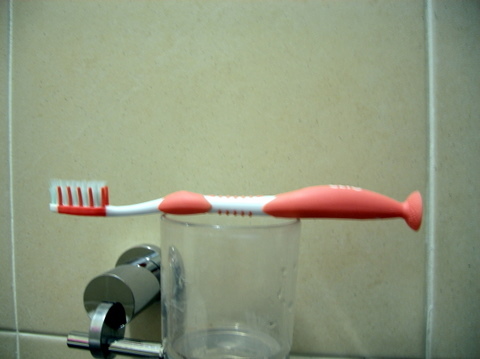 After some time, we have to change the toothbrush. But I found that the handle of the brush is perfectly alright. The only thing which we cannot use any longer is bristle or hair. So, if we can replace only the head of it and use the handle more, it would be great saving. It would be economically great saving, but it also would be environmentally, I believe. As we know, the handle of the brush is plastic, and the plastic is made of petroleum. If the head of the brush is replaceable, we would need and make much less handle – this will save the environment. And of course, we discard it much less. It would save the environment greatly, I strongly believe. 치솔을 사용하다보면 치솔모가 달아서 바꿔야 한다. 하지만, 망가지는 것은 솔 뿐이고 언제나 손잡이는 완벽하다. 그런데 생각해 보니, 치솔의 대가리 부분만 바꿀 수 있고, 손잡이는 그대로 쓸 수 있다면, 꽤 엄청난 절약이 될 듯 하다. 물론 경제적으로도 절약이 되겠지만, 새로운 손잡이를 적게 만들게 되어서 (손잡이는 플라스틱으로 석유로 만든다) 환경에 도움이 되고, 폐기하는 것도 줄어들어서 또한 환경에 도움이 될 것이다. 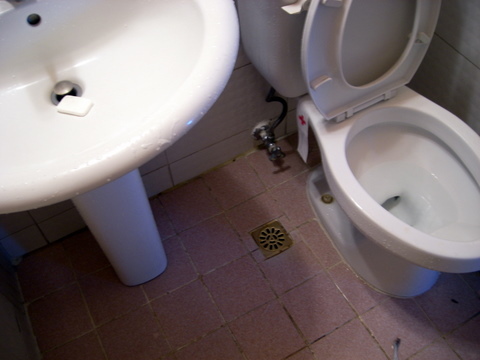 Korean bath room has another sewerage hole out of the bath tub. You can find it at any house, hotel, hostel, and building in Korea. This is taken at Jeju-Seoul business hotel. At the left of this picture was the bath tub. Of course there is another sewerage hole in the bath tub. It is so natural for Koreans, and this korean’s concept make some trouble. Some Koreans went abroad, and they took shower in and out of the tub together. And they later found there was no hole out of the tub. 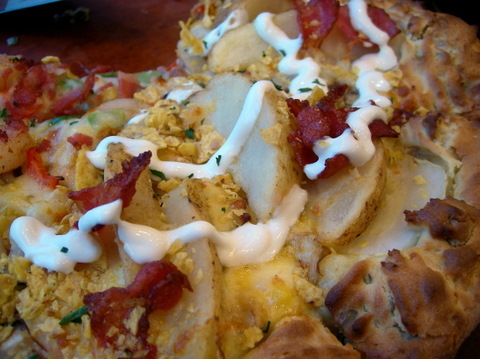 I went to Mr. Pizza, Mogdong. When I go for pizza, I go to Mr. Pizza if possible because the pizza of Mr. Pizza is far much better than that of Pizza Hut. Mr. Pizza has two major charicteristics. One is that their pizza has less oil and not greasy which make the taste better. And the other is almost all Mr. Pizza’s crews are not kind. 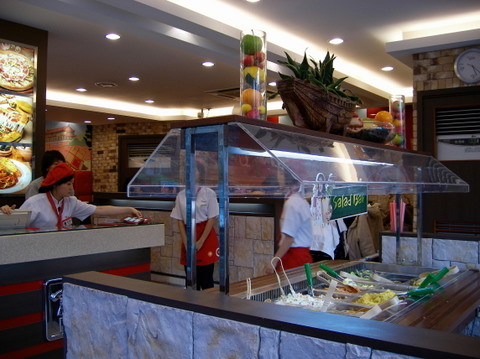 I visited and ate at so many Mr. Pizza store, and found no store where the crews were kind and nice. At other store, the crew would not come even when I called them. At mogdong store, they ran to me when I lift my head to order after seeing the menu book. They checked my cup is empty or not continually. They were watching every and each customers. Wow, it was the first kindness that I faced at Mr. Pizza. I ate Grand Prix for the first time, yesterday. Grand Prix is the brand new pizza from Mr. Pizza. Well, I ate usually Secret Garden. The half of the topping of Grand Prix was of shrimp, and the other half was of potato. The bread around the pizza was european cookie. Well, I want to give four and half stars (Max. five). It has really less oil and is not greasy. I love it. The dipping sources were also so great. Mr. Pizza has never disappointed me with its taste. 어제 미스터 피자 목동점에 갔다. 나는 피자를 먹으러 가면 가능하면 미스터 피자로 간다. 왜냐면 미스터 피자가 피자 헛보다 훨씬 맛있기 때문이다. 모든 사람들이 피자헛을 먹고 나서는 “피자 헛먹었다”고 한다. 미스터 피자의 특징은 크게 두가지다. 먼저 피자에 기름이 적어 담백하고 맛있다. 그리고 불친절하다. 내가 정말 많은 미스터 피자 매장에 가봤지만 단 한 곳도 친절한 곳을 발견하지 못했다. 다른 매장에서는 불러도 잘 오지 않던데, 목동점에서는 메뉴를 보다가 주문을 하기 위해서 고개만 들어도 달려왔다. 콜라가 비었는지도 수시로 보고, 고객들에게 관심을 갖고 있었다. 정말, 많은 미스터 피자 매장을 다녀봤지만, 처음 겪는 친절이었다. 어제 먹은 피자는 그랑프리를 처음 먹어봤다. 여태까지는 시크릿 가든을 주로 먹었다. 그랑프리는 토핑의 절반은 새우, 절반은 감자였다. 그리고 아래 빵의 주변부는 밤과자 비슷한 쿠키였다. 평가를 내리자면 별 다섯 개 가운데 네 개 반 이상을 주겠다. 정말 기름기가 적어서 담백하고 맛이 좋다. 찍어먹는 소스도 꽤 좋았다. 역시 미스터 피자는 맛으로는 나를 한 번도 실망시킨 적이 없다. My eldest sister bought me this running shoes: Prospecs. It is for summer use, and worth about sisty dollars. I saw Nodame Cantabile, the Japanese TV series. Juri Ueno got the major role. She also played major role in the movie, Swing Girls. This TV series has so much fun. I think most actors and actress got the right role. And I also believe that there is no proper actress but Juri Ueno. This TV series gives us one more pleasure – the Classic music. This expressed the classic music as pleasant and happiness. The scene above is the most important one through the entire series, I think. 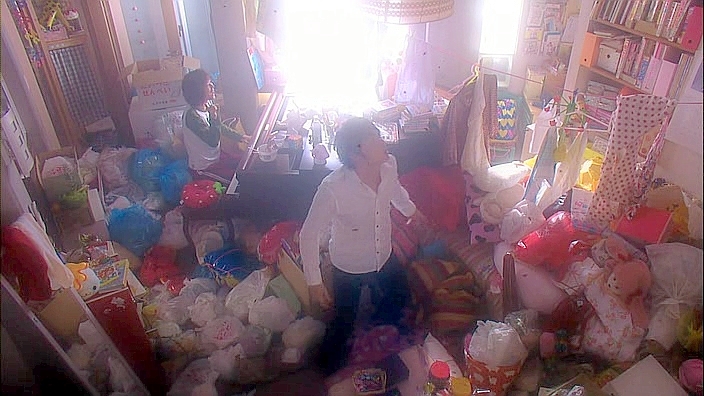 They are in Nodame’s room, and black dots are the flies. This single scene tracts the whole series (eleven episodes). I want to give three and half stars among five. I found there are differences among the TV series of Korea, Japan and USA. Korean series: seem to be made for housewives, deals with illicit relationships, and have so many too many weeping scenes. Japanese series: have no absolute wicked one(The wicked one also does good in t he ending part. ), have no big crisis or tension. We can see it and relax. USA series: have too much tension and it make me tired. Of course Friends has not. 노다메 칸타빌레라는 일본 드라마를 보게 되었다. 주인공은 스윙걸스에서 나왔던 우에노 주리가 맡았다. 상당히 재밌는 코믹 드라마로 부담없이 즐기기에 딱 좋다. 각 배역들이 매우 잘 맞는 것 같다. 특히 주인공 여자 역은 우에노 주리가 아니면 어울릴 사람이 없을 것 같다는 생각이 든다. 노다메는 주인공의 별명으로 원래 이름은 “노다 메구미”인데 모두 줄여서 노다메라고 부른다. 이 드라마의 또 다른 좋은 점은 클래식을 듣는 즐거움이 있다는 것이다. 클래식을 즐겁고 행복하게 잘 표현해 냈다. 이 장면은 노다메가 치아키를 만나는 장면으로 노다메의 방이다. 캡쳐의 검은 점들은 파리들이다. 이 한 장면이 나머지 드라마 전체(총 11화)를 이끌어 간다. 강추까지는 아니고 그냥 추천으로 별 3개 반을 주고 싶다. 한국, 일본, 그리고 미국의 드라마를 봐왔는데, 국적에 따라 특색이 확실히 있는 것 같다. 한국 드라마: 주부를 주 대상으로 하는 듯 하며, 불륜이 주 소재가 되는 경우가 많다. 늘 우는 장면이 참 많다. 일본 드라마: 절대 악인이 없으며 나빴던 사람도 나중에 착한 일만 한다. 큰 위기나 긴장이 없다. 가벼운 마음으로 쉽게 볼 수가 있다. 미국 드라마: 긴장이 너무 심하다. 그래서 나 같은 사람은 오래 보면 상당히 피곤해 진다. 물론 Friends같은 드라마는 제외다. 대체로 위와 같은 성격을 갖는 것 같다. 그다지 많이 헷갈리지 않지만, 인터넷에서 글을 볼 때 많은 사람들이 아주 혼란스러워하는 것 같은 것이 ‘돼’와 ‘되’다. 아마 이 문제도 일반적인 한국인들이 ‘되’, ‘돼’, ‘뒈’의 발음을 구분하지 못하고 동일하게 듣고 말하기 때문에 발생하는 것으로 생각된다. 쉽게 말해 ‘돼’는 ‘되어’의 줄임 말이다. 이에 대해 역시 퍼온 글이 있다. 출처는 국립국어 연구원의 글로 URL은 http://www.korean.go.kr/nkview/nknews/200207/48_3.html다. ‘되다’는 그 어미와 결합하는 모양에 따라 ‘되’ 혹은 ‘돼’로 그 모양이 변한다. 그렇다면 “이렇게 해도 되.”와 “이렇게 해도 돼.” 가운데 어떤 것이 옳은 표기일까? 지금부터 ‘되다’의 활용형을 자세하게 알아보도록 하자. (1)의 예들은 자음으로 시작하는 어미나 매개 모음 ‘으’를 가진 어미가 ‘되다’에 결합한 것이다. 이에 비하여 (2)의 예들은 어미 ‘-어’, ‘-었-‘ 등이 ‘되다’에 결합한 것임을 알 수 있다. (2)의 예와 같이 ‘되다’에 ‘-어’, ‘-었-‘이 연결되어 줄어들 적에는 ‘돼’, ‘됐-‘과 같이 쓸 수 있다. (‘한글 맞춤법’제 35항 참조)거꾸로 말하면 ‘돼’, ‘됐-‘은 ‘되어’, ‘되었-‘의 준말인 것이다. 그러므로 ‘되다’가 쓰인 자리에 어미 ‘-어’를 삽입해서 문장이 성립하지 않으면 ‘되’로, 성립하면 ‘되어(돼), 되었-(됐-)’로 써야 한다. ‘돼’, ‘됐-‘은 물론 줄기 전의 형태인 ‘되어’, ‘되었-‘으로도 쓸 수 있다. 그런데 (2ㄱ)의 “… 마쳐야 돼.”처럼 문장의 맨 끝에 쓰이는 ‘돼’는 ‘되어’로 쓰거나 말하지는 않는다. 그래서 이때의 ‘돼’를 ‘되어’의 준말로 인정하기 어려울 수도 있다. 하지만 이것은 다음의 예를 살펴보면 이해할 수 있는 것이다. (5) ㄱ. 철수(가) 밥(을) 먹었어(먹-었어)./ 어머니(의) 심부름(을) 다 했니(하-였니)? ㄴ. 저기 좀 봐(보-아)./ 이리 와(오-아)./ 나 저기 앉혀 줘(주-어)./ 편지 좀 써(쓰-어). ㄷ. 그 공 이리 차(차-아)./ 거기 서(서-어)./ 이불 개(개-어). (5)에서 볼 수 있듯이, 국어에서는 조사는 생략해도 되지만 어미는 하나라도 생략하면 원래의 의미에서 멀어지거나 문장이 성립하지 않는다. (5ㄱ)에서 조사인 ‘가, 을, 의’ 등은 생략해도 문장이 성립하지만 어미인 ‘-었- + -어’, ‘-였- + -니’ 등은 하나라도 생략하면 의미가 달라지거나 잘못된 문장이 되는 것이다. (5ㄴ)에서도 명령형 어미인 ‘-아/어’를 생략하면 비문이 된다. (5ㄷ)의 ‘차, 서, 개’ 등은 외관상 어미가 없는 듯이 보이지만 사실은 ‘차- + -아’, ‘서- + -어’, ‘개- + -어’ 등이 줄어든 것이다. (5′)ㄱ. *철수 밥 먹었-./ *어머니 심부름 다 하/했-. ㄴ. *저기 좀 보-./ *이리 오-. / *나 저기 앉혀 주-. / *편지 좀 쓰-. ㄷ. *그 공 이리 차-./ *거기 서-./ *이불 개-. 그럼, 국어의 모든 용언은 어미가 있어야 문장에서 쓰일 수 있다는 점을 염두에 두면서 다시 (2ㄱ)을 살펴보자. (6) 9시까지는 작업을 마쳐야 돼. 이제 우리는 이 문장이 “… 마쳐야 되-.”와 같이 어간 형태만으로 끝날 수는 없고 ‘되-‘ 뒤에 어미가 필요하다는 사실을 알 수 있게 되었다. 위 (6) 예문에 필요한 어미는 종결 어미 ‘-어/아’이고 어간 ‘되-‘는 음성 모음이므로 ‘되- + -어’로 끝나야 함을 알 수 있다. 이 ‘되어’가 줄어들어 ‘돼’가 되는 것이다. 한편, ‘되다’와 같은 활용을 보이는 것으로 ‘괴다, 뵈다, 쇠다, 쐬다’ 등이 있다.